Student protest has a long history of making change in America. Will those following the tragedy at Marjory Stoneman Douglas High School continue to make change? Help students understand how and why with this week’s CLP current event. The student survivors of the Marjory Stoneman Douglas High School massacre are telling us theirs will be the last school shooting. May it be so. CLP: Shows one district’s struggle to find the balance between allowing students to exercise First Amendment rights and schools expectations. What is a protest? How is the right to protest guaranteed in the First Amendment? Does the right to protest protect juveniles? If not, why not? 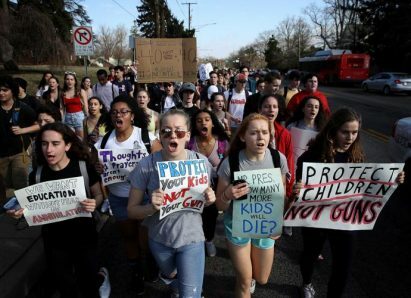 Why are adults concerned about youth protests? What are the regulations concerning the public schools’ right to discipline students for protests? What are school district responsibilities when students protest? What are some ideas presented to prevent gun violence? Does action to prevent gun violence result in the denial of other rights? Is mental health a cause of gun violence? Will legislators listen to students? Should lawmakers listen to students? Is there a connection between democracy and the right to protest? What are the limits on peaceful protests? What role can students play in making changes? Gun safety and other issues? What does it mean to be a “change agent”? What role do teachers and school personnel play in mentoring students to be active citizens? What is the role of social media in facilitating protests? How can teenagers and adults work together to make our country a better and safer place? Who are the people you think of as models of making positive changes? What is activism and what are the results of activism? How does activism relate to community building? CLP: A great reminder for students that there are ways to make change when you can’t do it in the voting booth. HS.35 Examine the pluralistic realities of society (e.g. race, poverty, gender and age), recognizing issues of equity, and evaluating need for change. Unit 5, Lesson 30: How does the First Amendment protect freedom to assemble, petition, and associate?